Jayne Freer put this article together after a recent visit to Helsbury. WHEN you think of a dog-friendly holiday you would be forgiven for conjuring up images of run-down, smelly accommodation with strict rules and regulations more suited to a concentration camp. And while you may happen to stumble across holiday retreats which allow ‘one small dog’ or ‘pets by prior arrangement’, the phrases ‘totally dog friendly’ and ‘luxury five star accommodation’ are not often even imagined in the same sentence. But I’ve discovered an absolute gem nestled virtually on our own doorstep but could be miles from anywhere. Helsbury Park near Camelford in north Cornwall is a dog owner’s dream. We stayed in Marhayes, one of two spacious, converted stone barns. There is also a farmhouse and bungalow to hire on this award-winning complex. The first thing that struck me on arrival was the attention to detail. Our holiday home was kitted out with literally everything we’d need – even stuff we didn’t think we would, such as a dog frizzbie and the parmasan cheese shaver! There’s an abundance of throws for the furniture so you don’t have to worry about your pets leaving their muddy marks. The interior was spectacular with slate floors – easy for clearing up any little doggy accidents – with underfloor heating. This along with the living room wood burner and plenty of logs and kindling created the perfect cosy atmosphere in which to unwind. And with puzzles, boardgames, books, mini snooker table and table tennis kit provided, you don’t even have to leave if you don’t want to. Upstairs there are three bedrooms, the two main rooms housing four-poster mega-comfy beds and the third with two singles. Each had ensuite shower rooms. 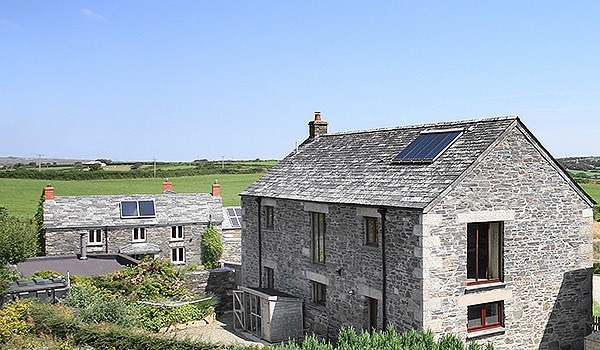 One of Helsbury’s many outstanding features is that it is surrounded by the most spectacular, breath-taking views stretching out to the edge of Bodmin Moor. Set in 100 acres, it comes complete with its own river running through an enchanting woodland and open fields. If you fancy venturing a little further afield the perfect-for-running-walking-cycling Camel Trail is a stone’s throw away, the nearest beach is around five minutes and of course there are the wonders of the moor itself. The trail up, across, around, and down Roughtor and Brown Willy is simply spectacular. So there’s plenty of choice for ‘walkies’. Oh, and the on-the-ball owners even have a selection of wellies stashed away if you’ve forgotten to bring your own. After a day’s dog walking why not sink into Helsbury’s fantastic new swimming pool, to help ease the aches and strains? The complex is built into the hillside to avoid spoiling the Camel valley view so you can swim to your heart’s content while still soaking in the stunning surrounds. And once you’ve splashed out a few lengths you can relax in the sauna, or shower and dry off and indulge in the massage chair before hitting the small but well-equipped gym. And as if that wasn’t enough to tempt you, Helsbury Park also boasts a ‘sustainable tourism’ strategy. Visitors are encouraged to recycle their waste in an array of recycling and compost bins, ditch the car and opt for saddle-back or walking, stay local, eat local, buy local, and be as economic with resources as possible. It’s a big part of Helsbury life. The welcome pack is a hefty ring-binder including all the information you need for your stay from suggested walks and the wildlife you may see, dog friendly places to eat, a beach guide and attractions to visit to keep you occupied. The owners actively promote other local business – the divine showering products are from the local St Kitts Herbery – while giving recommendations for the best local meat suppliers and farm shops. My own recommendation would be The Old Inn at St Breward. A roaring log fire, the finest of ales and a warm welcome for both two and four-legged patrons – just how a good pub should be. Helsbury does have its own ‘doggy code’ to help maintain it’s five star status. But to be honest, any responsible dog owner would have no problem adhering to the few house rules such as picking up poop, covering furniture with blankets and not leaving dogs alone in the cottages to turn the sideboard into sawdust. And to help, the owners have even thought of equipping each cottage with a huge private dog kennel for if you do need to leave your pet behind along with stairgates to help prevent curious canines from vanishing upstairs. I have to say Helsbury Park is one of the best holiday homes I’ve ever experienced – with or without dog.